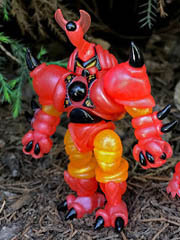 Via The Godbeast's own site: Wave 20 of Kabuto Mushi! 4 colors of plastic with varying awesome builds and deco variations are going to be up for grabs at 8:00 PM Central on Friday, April 28. Hey, that's this week! They will also be sold in person ay Kansas City Planet Comicon at Bartel Hall Convention Center. A tribute! Standing about 3-inches tall, Phanoid is the next in this year's series of ongoing tributes to Fisher-Price's surprisingly wonderful Adventure People 3 3/4-inch action figure line. The genius of it was that it was packed with mundane normal then-modern Earth stuff, plus it had a swell space line partially made up of mixing and matching parts from said mundane line in wacky colors to create the likes of X-Ray Man and Clawtron. It was a great example of how you could make something new out of a recolor that doesn't generally feel like the original. I am a huge, huge sucker for M.U.S.C.L.E.-style mini figures. Huge. So I when I saw the Mega Bit Pheyden Flesh Set I was sitting here asking if I needed to buy yet another set of these guys. After realizing I still had to order that Copper Tape from Flying Vipers and a couple of t-shirts, the answer was a fast "yes." Once I'm paying shipping, all bets are off - if you sell music and band shirts drawn by Matt Doughty - in my size, no less? I'm going to give you my business. So here we are, more figures I don't need, but do want. The nifty Bio-Masters Shop has been updated! Two new creature colors can be delivered to your doorstep right now. Neo Nonilla Cosmalar (pictured) is joined by a Rayexx Infused counterpart. Each one is $18.00. Click here to check availability. I don't know how many of you know how these reviews work, but to do one every day I have to basically set them up like an assembly line and do them weeks - sometimes months - in advance. This Outer Space Men Cosmic Radiation Astro-Nautilus comes out tonight, and getting it shot, reviewed, and up this quickly can be a trouble. (Heck, this intro? Wrote it when the figure was still in the mail.) That's one of the good and bad things about reviewing toys - on one hand, I know what kind of quality to expect from this ongoing line as the actual manifestation rarely disappoints. It also speaks of a certain homogeny that creeps in to even the best indie line - eventually I can tell you what a figure will be before it even arrives. The Astro-Nautilus mold is an awesome, creative design that is one of my favorites. The glow plastic from the Glyos factory is second to none, resulting in some of the brightest glowing figures you can buy today. I haven't even held the figure in my hands yet, and I'm perfectly comfortable telling you that fans of glow and this design are going to want it and should buy it along with whatever other glow figures are in the store that you don't have yet. Scary, eh? Anyway, let's open the bag. Fancy! Onell Design posted that they were aiming to do fancier paint jobs more in line with The Outer Space Men, and they got it. Standing about 3-inches tall, Glyarmor Cytechion DX is expensive but there's a lot of action here. The figure is molded in the same clear green plastic as Rayexx [FOTD #1,665], but with layers of paint. Many layers. 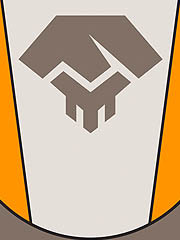 There's a creamy yellow layer, metallic gold, and some grey - plus a few places for the green to peer through. Skate Wars! A new secret figure is assumed to be Pheyden as Brainoid from Adventure People - and it's joined by an Outer Space Men Cyclops, plus Pheyden with bonus OSM accessories. Which I didn't realize until after I placed my orders. Read the fine print, people. Click here to see the April 5 2017 Onell Design drop menu. Another Gremlins-inspired figure! The Quallerran Waimog brings you a Mogwai-derived creation with appropriate deco. The white plastic has been painted up to resemble those Gizmo action figures you bought and cherished or passed on and kicked yourself over, whichever. Hey, a new drop! Onell Design's post Laser Case teases "The Skate Wars," a new batch of figures hitting Wednesday, April 5 2017 at 9:30 PM Eastern. What is it? No idea. I'm excited though. The first new Outer Space Men character in a few years just got previewed on the official Instagram. Have a look at Astrodite!